Chicago Mayor Rahm Emanuel has fired the city’s police superintendent, Garry F. McCarthy, following a botched handling of the shooting of 17 year-old Laquan McDonald by a Chicago police officer. 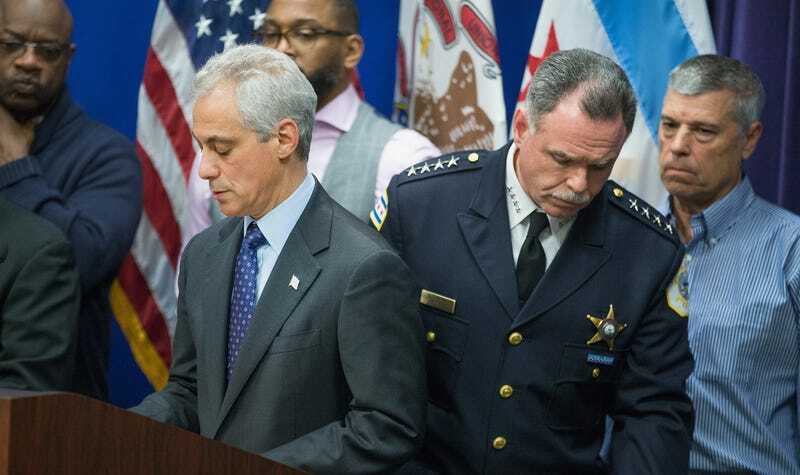 “This morning, I formally asked for his resignation,” Emanuel said. McCarthy was a pick by the mayor himself, who has been losing people in senior leadership positions at a rapid pace. Barbara Byrd-Bennet was forced to step down as the Chicago Public Schools chief due to charges of fraud in a kickback scheme that would have netted her millions of dollars. Byrd-Bennet stepped in as the replacement for Emanuel’s first choice, Jean-Claude Brizard, after Emmanuel fired him following Chicago’s teacher’s union strike in 2012. In December 2014, former city controller Amer Ahmad, another Emanuel pick, was sentenced to 15 years in federal prison on bribery and conspiracy charges. Mayor Emanuel noted that the city had lost its trust in McCarthy’s ability to lead. But it’s becoming clear, if it wasn’t already, that the common denominator in all these so-called trust issues is the mayor himself—who, as a damning New York Times op-ed reminds us, went to court to prevent the McDonald footage from being released while he was seeking re-election. In a press conference, Emanuel reportedly accepted responsibility for the events surrounding Laquan McDonald’s death. If Rahm Emanuel truly believes that, it is time he recognizes that the key person in all these failures—and perhaps the one that needs to be removed—is the mayor himself.